Easy weekday dinner for the whole family. 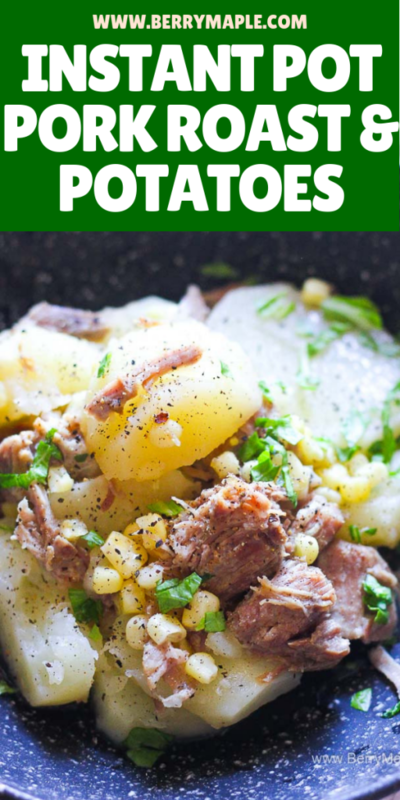 Affordable ingredients and a lot of flavor- try this Instant pot pork roast and potatoes. 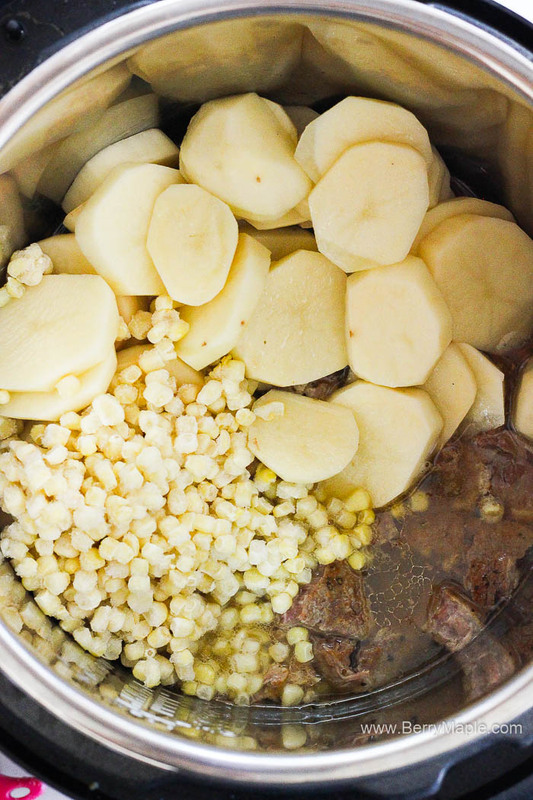 Instant Pot for any time of the year. 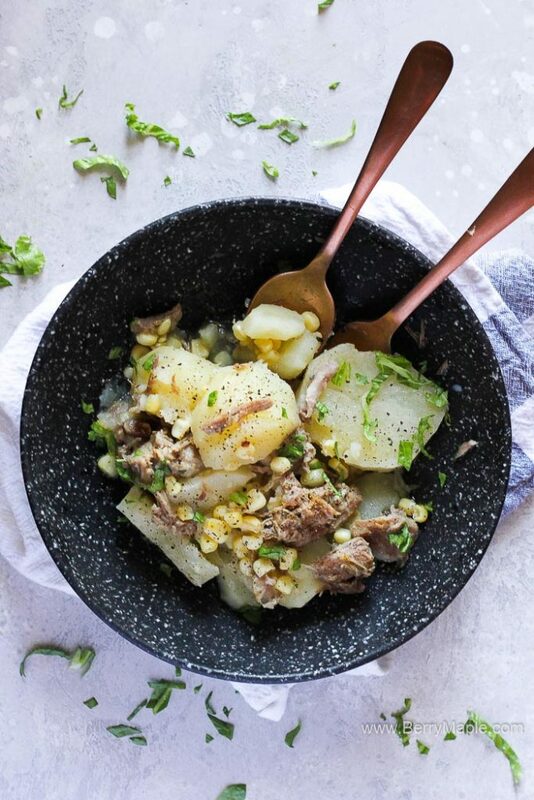 It works perfect with a big variety of dishes, from perfect summery Instant Pot infused water recipes to lovely stews and soups. I made this dish on a busy weekday evening, when i got home with my little kids and didn’t have anything ready yet for dinner. I had boneless pork ribs from Costco, that i didn’t freeze yet and a bag of potatoes. Perfect ingredients for an easy weeknight instant pot kid friendly meal! If you prefer, you can add different kind of spices in to this dish, but i went with Poppy’s seasoning. Best potatoes to be used here are golden potatoes, but any other kind will work well too. Do you like corn? My kids love to eat everything with corn! If you are able to add fresh one- go for it! Canned will be delicious here too. I used frozen white sweet corn, because i had it in the freezer and i know it was flesh frozen to keep all the vitamins inside. Cooking for kids is not easy, but IP is the you best helper! Try this Instant Pot chicken and rice pilaf, very kid friendly and easy to make. Just look at this gorgeous plate! So comforting, so aromatic, so delicious and oh so easy! Very affordable too. If you like pork, please try this Instant Pot Pork Ragu, you will not be disappointed! Also an extremely kid friendly dish. How to cook pork roast in instant pot. Hope you will enjoy this recipe! Please let me know in comments if you cooked it! 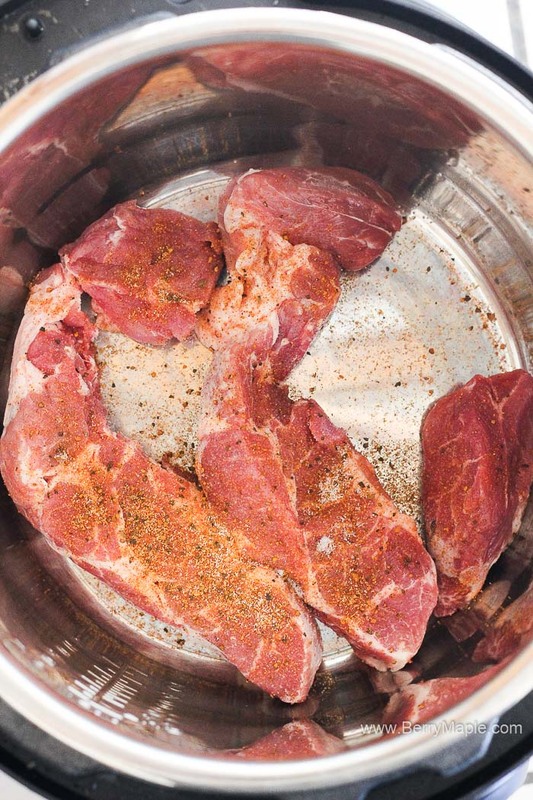 Place pork shoulder in to your Instant Pot. Add water, seasoning, salt and pepper. Close and lock the lid. Set timer to 40 minutes manual. Quick release once done. Meanwhile peel potatoes and slice them( not too thin). Open the lid and shred the pork (i like to leave big chunks but its up to you). 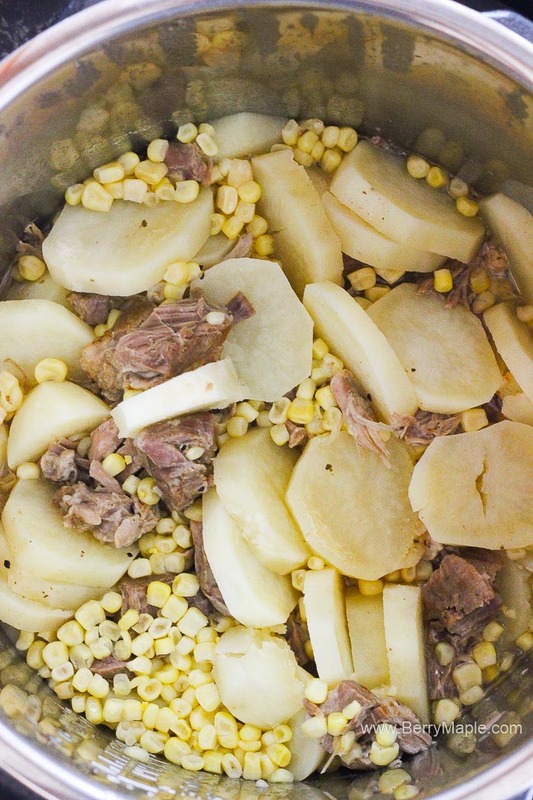 Add potatoes and corn and mix together. Close and lock the lid. Set manual for 4 minutes . Quick release. What changea do i nees to make if the roast is frozen? Can I do thus with 3lbs pork roast? What changes would I make? 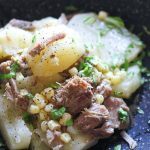 I can never turn down an Instant pot recipe! It makes making midweek dinners so much easier! I haven’t joined the Instant Pot craze yet. But man, this dish looks fabulous! 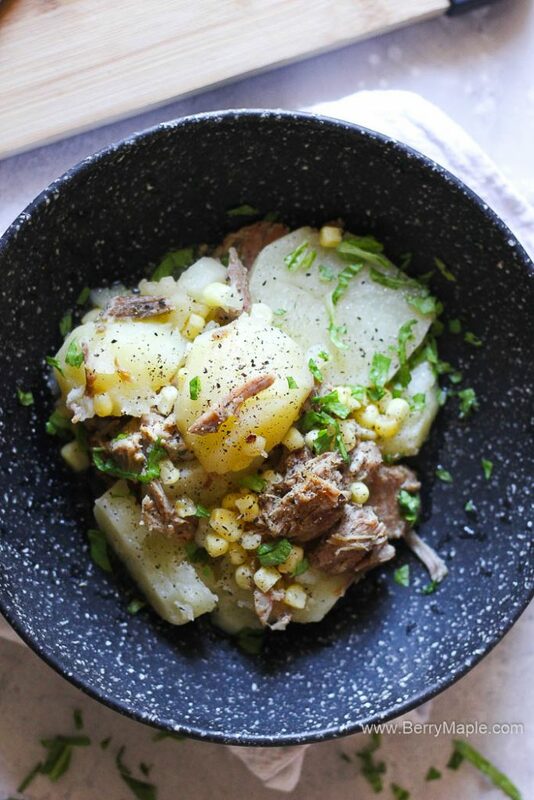 I’m a huge corn fan too, and love that you use it in this dish. Easy dinner?! Sign me up! My hubby is going to be very happy when I make this for dinner! So funny, I made an Italian Pork Ragu in the Instant Pot! 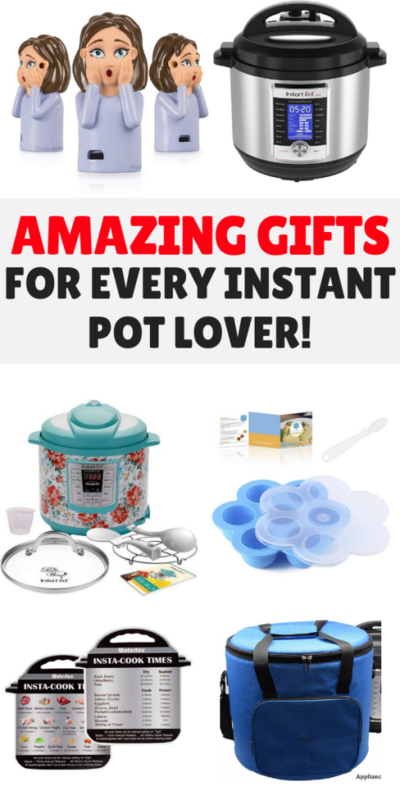 I completely agree, the instant pot is a game changer for making easy meals! 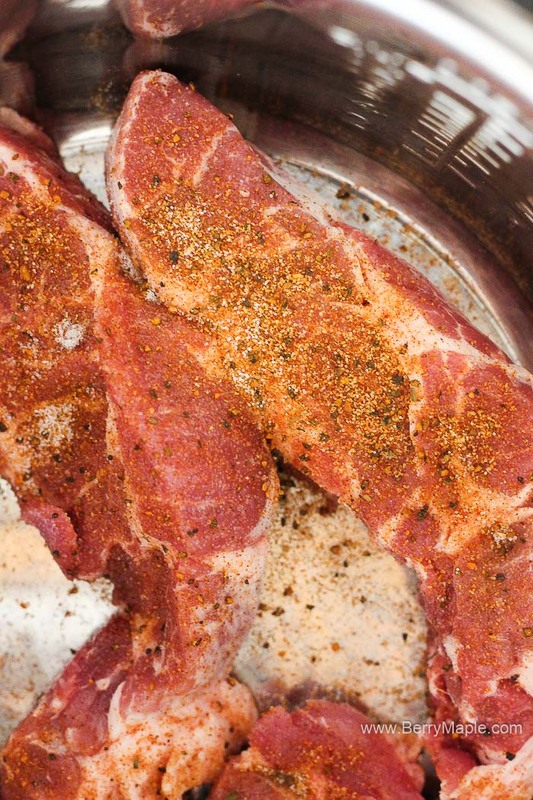 love that you used pork ribs, great flavor. Adding in potatoes makes a great meal! I love my pressure cooker for this very reason. 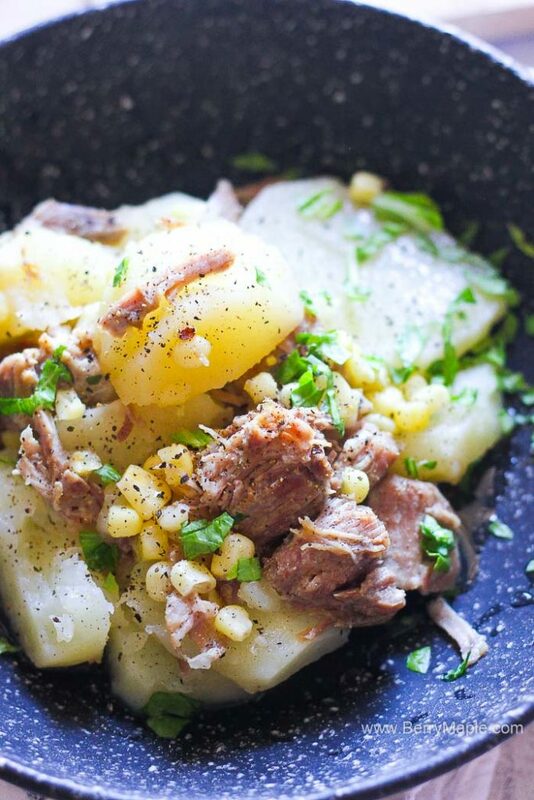 This pork roast and potatoes recipe looks like a great weeknight meal that everyone would love! Ha! I am getting an instant pot for Christmas (present to self) and have already started a list of recipes to try! This one will defs be on it! I love how simple instant pot recipes are. And anything with potatoes i’m all in. This pork roast looks delicious! You can’t go wrong with a simple recipe like this. It looks so darn easy and tasty and perfect for these colder months! I love how simple and easy this is. I have never cooked pork in an instant pot. This looks like comfort food my kids would enjoy. Looks like the ultiimate comfort food! My husband (and myself!) would adore this dinner!! We are getting into the colder weather season and roast pork is one of my favorites! I can’t wait to try this! Thanks for sharing! mmm! this sounds delicious. I love roast pork on a chilly day, and they will be here soon. thanks for sharing! I made this at the weekend and the whole family loved it. It is so cold here in Australia at the moment so it was a really comforting hearty bowl. Will be making this again for sure! This is delicious home cooking! I love what the instant pot can do!